It can weld up to 1" aluminum. Compared to traditional welding machines the Dynasty 700 Welder's Total Arc Control provides maximum productivity and weld quality, while conserving energy. 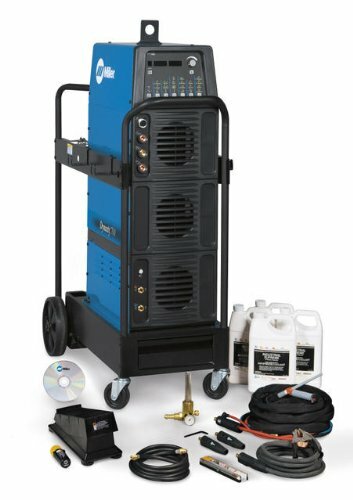 The AC TIG Features independent amplitude/amperage control, extended AC balance (controls amount of oxide cleaning), AC frequency (controls width and force of arc). The DC TIG features an exceptionally smooth and precise arc for welding even the most exotic materials. It also features pulse controls to manage pulse frequency capable of pulsing 5000 pulses per second. Pulsing reduces heat input and adds arc stability. The STICK features AC/DC. Tailored arc control DIG allows the arc to be changed for specific electrode and applications. Hot Start enables positive arc starts without sticking. AC frequency control provides additional stability and smoothness when welding in AC.